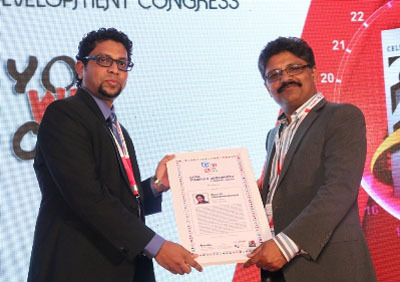 Training and marketing consultancy company Epitom Consulting won the ‘Best Global Training and Development Leadership’ Award at the World HRD Congress held in Mumbai, India, recently. Founder/Director of Epitom Ragulan Tharmakulasingham received the award in the presence of around 1,800 participants from over 100 countries at the event. The award conferred on Epitom Consulting is in recognition of its contribution to the sphere of training and development on a local and global scale. Epitom received this award due to its excellence in offering qualified professionals, and locally and internationally exposed experts to its clientele as its results-driven approach and excellence in the field of training further strengthen its customised programmes.